When billionaire H.J. Jarrett is shot to death on a bike path in prestigious Granger Park, the killer is seen running away by a man who is apparently in the right place at the right time. However, Glendale Homicide Lieutenant Hank Donaghue and Detective Karen Stainer discover to their dismay that their only eyewitness suffers from a rare psychotic disorder that makes his testimony useless. As Donaghue’s investigation focuses on the top one percent of Glendale’s social stratum, including close friends of his own mother, Stainer finds herself alone when her gut instinct tells her that their eyewitness may be right after all! 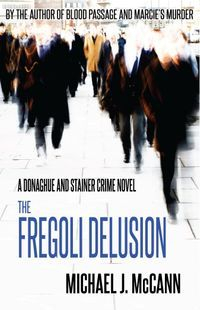 Ask your local independent bookstore to order THE FREGOLI DELUSION in paperback for you. It's available world-wide through the Ingram catalog.